Click here to view our fabric options. Click here to order fabric swatches. Style extends from the straight lines of the square back to the rounded, extra cushioned arms that are highlighted with contrasting cording. Comfort is not sacrificed by style. The semi-attached back is blown with high-loft premium cushioning fibers, while the seat utilizes a high-density foam cushion for maximum resiliency. Power recliners put relaxation at your fingertips. At the push of a button, you can recline to an infinite number of positions with one of the smoothest and fastest recline speeds in the industry. Power recliners provide an infinite number of comfortable positions. Hand-assembled hardwood frames and reliable power mechanisms deliver years of solid, smooth operation. Traditional power recliners, transitional power recliners and contemporary power recliners - available in hundreds of fabric and leather selections - make home decoration just as easy. The Wallhugger design means the chair will recline outward away from the wall. The rocker recliner will rock and recline. This lift recliner has a weight limitation of 250 lbs. Removable seat backs allow for ease in transportation and handling, and customers have access to customize the comfort level of the lumbar support. Pads are attached with industrial-strength Velcro for adjustments and to looking new for life. High-Density Foam/High-Loft Premium Polyester Cushioning makes for a plush and comfortable seat. Doweled, Corner Blocked, Glued and Screwed. Multiple processes, occasionally including truss plates, ensure solid, long-lasting joints. SHIPPING: Shipping costs around $149 to most places in the 48 states USA. This will arrive as a curb only drop which means that you will need two strong people to take it off of the truck and bring it indoors. Our shipper calls and makes an appointment with you. 90% of our customers receive their chairs within 4-5 weeks of order. Warranty: Our sturdy chairs rarely need warranty work. If one does, our warranty is one year free parts. Style extends from the straight lines of the square back to the rounded, extra cushioned arms that are highlighted with contrasting cording. Comfort is not sacrificed by style. The semi-attached back is blown with high-loft premium cushioning fibers, while the seat utilizes a high-density foam cushion for maximum resiliency. 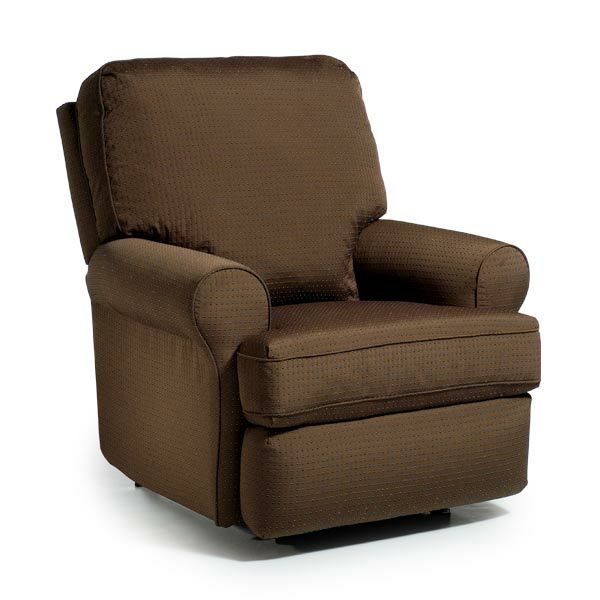 Power recliners put relaxation at your fingertips. At the push of a button, you can recline to an infinite number of positions with one of the smoothest and fastest recline speeds in the industry. Power recliners provide an infinite number of comfortable positions. Hand-assembled hardwood frames and reliable power mechanisms deliver years of solid, smooth operation. Traditional power recliners, transitional power recliners and contemporary power recliners - available in hundreds of fabric and leather selections - make home decoration just as easy. The Wallhugger design means the chair will recline outward away from the wall. The rocker recliner will rock and recline. This lift recliner has a weight limitation of 250 lbs. High Density Cushioning Foam/High-Loft Premium Polyester Cushioning. One of the plushest, most comfortable seats in the industry. Doweled, Corner Blacked, Glued and Screwed. Multiple processes, sometimes including truss plates where needed to ensure long lasting joints. Superior Seat Spring Construction. Sinuous wire springs are cross-wired to prevent sagging. Spring clips are coated with polypropylene to prevent squeaks. Our chairs feature hardwood frame construction. Special attention is added at each step of construction and every chair is individually upholstered by an experienced craftsman. Chair Height: 40 inches. Chair Width: 36 inches. Chair Depth: 37 inches. Seat Height: 18.5 inches. Seat Width: 20 inches. Seat Depth: 19.5 inches.